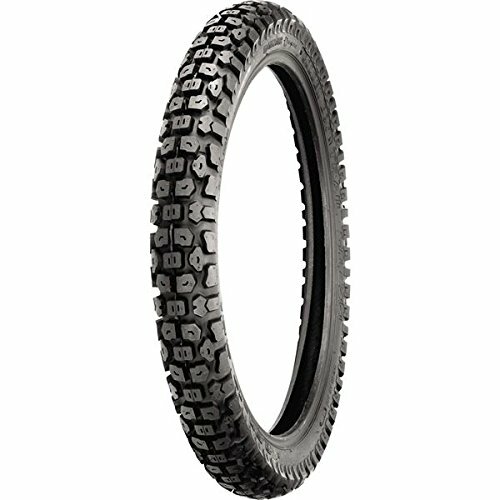 4 ply carcass constructionDual purpose street and trail designDesigned to be equally at home on dirt or pavementThis dirt bike tire is tube typeThese sport touring motorcycle tires are P rated for speeds up to 94 mphDOT approvedNote:Tire sizes 2.50-17 (Part # 369-874402), 3.00-18 (Part # 369-874406), and 3.00-21(Part # 369-874413) are L rated for speeds up to 75 mph.Tire sizes 4.60-17 (Part # 369-874404), 4.10-18 (Part # 369-874408), and 4.60-18 (Part # 369-874409) are S rated for speeds up to 112 mph.Available in the following motorcycle tire sizes: 2.75-14, 3.00-16, 2.50-17, 3.00-17, 4.60-17, 5.10-17, 3.00-18, 3.50-18, 4.10-18, 4.60-18, 5.10-18, 2.75-19, 2.75-21 and 3.00-21. DOT-approved, dual-purpose street and trail design tire. Shinko designed all sizes for front or rear fitment.